It is sometimes necessary to select an exiting Maven artifact, e.g. to be used as a dependency. Maven artifacts are stored in repositories. There is one local repository serving as a cache, as well as one or more remote repositories accessible through the network. There are many publicly available repositories on the net, and you also can configure your own repository in your internal network. The browser window consists of several parts. On the left side, there is the artifact tree view. On the right side there is the artifact data view. In the upper part, there is the repository selector. In the artifact tree view, you select actual artifact to view. The tree is organized in a hierarchical way. On the top level are groups. Under each group node, there are artifacts from that group. Under the artifact are versions, and for some artifacts there are further level based on classifiers. In order to select an artifact, you need to find group, artifact name, version and optionally classifier that you are interested in and click on it. Information about the artifact will be displayed in the data view on the right side. To expand or collapse a node, double click on it or click once on the +/- button next to it. Note that you must click on the most specific node related to choosen artifact (a version or clasifier) to view the data. Otherwise data will not display because your choice is ambiguous. Also be prepared to wait a couple of seconds before the data shows up, as IntegraStudio orders Maven to download the detailed information from the network and it can take some time. Sometimes the download operation may fail or freeze. The cause of the first problem might be an outdated index or an inconsistency within the repository. If the data does not download at all, there might be network or server problem. Regarding public remote repositories on the Internet, bear in mind that the servers might be overloaded or temporarily unavailable. In case of such problems, trying again after a while or trying to view different artifact might help. The data view displays available data for choosen artifact. It is actually a visualized POM file. Some POMs contain more data than others. For example, project description is not mandatory, as well as developer information, etc. Thus, level of detail varies from artifact to artifact. By right-clicking on selected row of information, you can open a context menu with options depending on which information row you clicked. If there is a URL, you can open it in a web browser. For most info you can also copy it to the clipboard. For expandable nodes, there are Expand all and Collapse all options. You can also order to close the repository viewer and open selected POM as XML file in Visual Studio (View this POM). 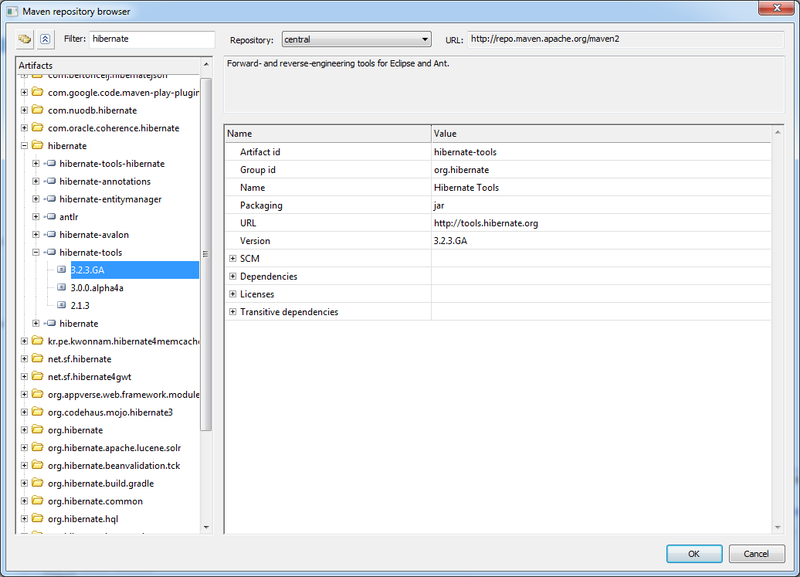 Clicking OK will accept choosen artifact and populate its data into appropriate fields of the Add new dependency dialog. You can still adjust any parameters manually. Clicking OK again will add the dependency into the project. The browser allows using multiple repositories. There is a repository selector in the upper part. Available repositories are taken from the project (Repositories node in Solution Explorer). The central repository is always available. You can filter the contents of the artifact tree view for easier selection. Enter some name (or part of it) into the Filter field, and groups in the view will be filtered to those containing that fragment. You can also change the way in which groups are organized by pressing the Display groups as tree button. Then, the groups with multiple parts (separated by dots) will be itself presented as hierarchies. There will be less items presented in the view at once, but you will need to click more tree elements to get to the final element. There is also Collapse all button which simply collapses all opened nodes.